Update: Since the time this article was written, the State Legislature has legalized passing a bicyclist in a no-passing zone when done safely with no oncoming traffic and adequate sight distance, passing at a distance of at least four feet or moving completely into the next lane. See § 20-150. Limitations on privilege of overtaking and passing. Narrow two-lane state roads are important travel routes for commuting and recreational bicyclists in North Carolina. Every day thousands of motorists pass bicyclists on these roads without incident. When there is little or no shoulder and the travel lane is narrow, competent drivers recognize that there isn’t room to pass within the bicyclist’s lane, and so they wait until the oncoming lane is clear of traffic for an adequate distance before moving into the next lane to pass. In many places where this occurs, a solid yellow centerline is striped to discourage passing of other motor vehicles. Traffic engineers place this striping where there is not adequate distance to safely pass a motor vehicle that is traveling near the maximum posted speed limit. But in the real world, drivers recognize that the distance required to pass a slow moving bicyclist is a small fraction of this distance, and invariably ignore the striping in favor of weighing the safety and convenience of passing under the existing conditions. Drivers routinely cross solid centerlines to pass bicyclists safely, and police routinely ignore this as long as the passing driver does not create a danger for oncoming traffic. Does this mean that it is legal? § 20-146. Drive on right side of highway; exceptions. (2) When an obstruction exists making it necessary to drive to the left of the center of the highway; provided, any person so doing shall yield the right-of-way to all vehicles traveling in the proper direction upon the unobstructed portion of the highway within such distance as to constitute an immediate hazard…. The prohibition of passing in a no-passing zone does not apply when an obstruction exists making it necessary to drive to the left of the center of the highway [§316.0875(3)]. Thus, when a cyclist is traveling so slowly as to constitute an “obstruction,” a motorist may cross the center line in a no-passing zone to pass the cyclist if the way is clear to do so, i.e., when it can be seen that any oncoming traffic is far enough ahead that the motorist could finish passing before coming within 200 feet of an oncoming vehicle. 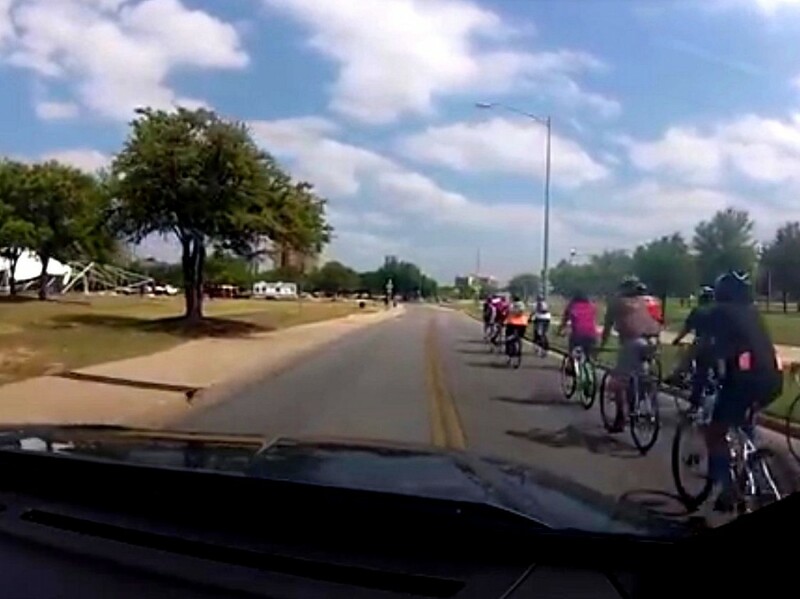 Police in Austin Texas, a state with similar passing laws, produced a video showing how to pass bicyclists by waiting until it is safe to cross a solid centerline. BikeWalk NC hopes that other police officers in NC will leverage this interpretation of § 20-146 so that they can have more practical and meaningful discussions about safe passing techniques on narrow roads by focusing on traffic conditions and sight distances. However, explicit clarifying language in the passing law is preferred for bicyclists, tractor drivers, and other slow moving vehicle operators, because such users don’t want to be framed as “obstructions.” Slow moving vehicles are legitimate traffic, and in some cases, bicyclists aren’t slow-moving. A more nuanced, realistic alternative is needed for North Carolina’s one-size-fits-all no-passing-zone law.